“Haggadah for the American Family” has been used by Jewish Americans for generations to welcome guests to the Seder Table. The phonetically transliterated Hebrew passages and English directions in this Haggadah book are easily understood by everyone taking part in the Seder ceremony. But don’t just take our word for it! 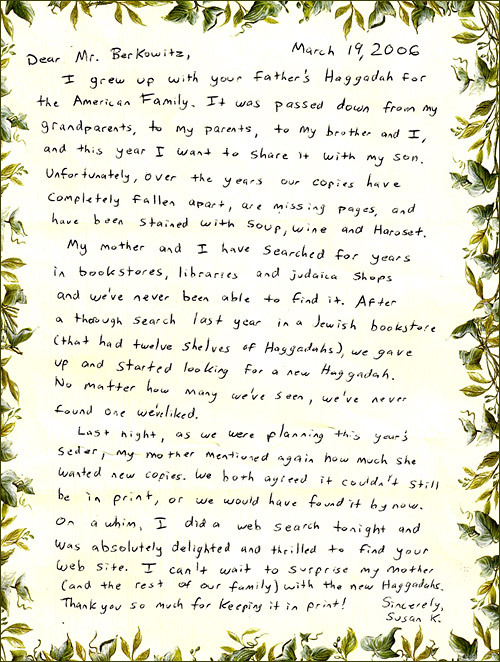 Many of those who have purchased “Haggadah for the American Family” have taken a moment to write to us. 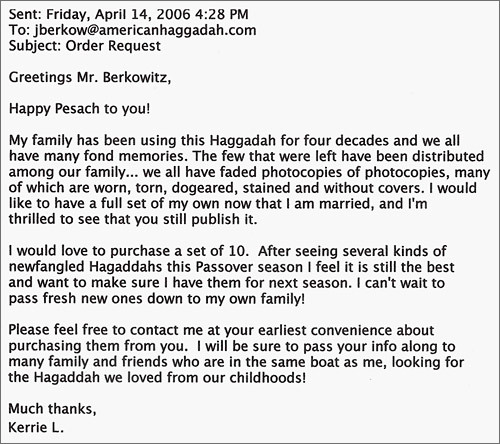 We invite you to scroll through a sampling of these letters (shown below) to discover what people are saying about Rabbi Martin Berkowitz’ popular Haggadah book for the Jewish Passover Seder. Please send me information on purchasing the Haggadah for the American Family. I am the chairman of our synagogue gift shop and have owned the Haggadah for thirty-two years. I would like to share it with others. My family will be thrilled that I have located these books. We have used them for 30 years and do not want any others but as I mentioned to Rocky on the phone, they are wine and food stained and most do not have covers. I decided last Pesach that I would have to find new ones. I am sure that my mother will want more so we will contact you after the holidays if she wants to order additional ones. Have a happy holiday. Many years ago you published a Haggadah for the American Family, written by Martin Berkowitz, Rabbi, Temple Adah Israel of the Main Line, Merion, PA.
We have enjoyed using this Haggadah for many, many years and they now show signs of wear and tear. I would like to replace these Haggadahs and would appreciate hearing form you if they are still available. The preparation and distribution of this Haggadah was sponsored by Standard Brands, makers of Chase and Sanborn products, etc. Thank you for taking care of this matter. All these years I thought we were using the Maxwell House Haggadah. And now I come to find out that we were using the Chase & Sanborn Haggadah. I used to have 1 Deluxe version of the Maxwell House one but I think I gave it away since I have so many of the ones your father wrote. Could you tell me what the differences are? Hag Simea to you and your family. Thank you. I was really delighted to see that you are selling your father’s Haggadah on line. He was a wonderful man. In the early 1980’s, he was my teacher at St. Joseph’s University. I liked him very much. Some years later, I discovered that my husband’s family used your father’s Haggadah for every Seder. The books are quite worn and falling apart, so a couple weeks ago, I went on-line in search of the same books. That is when I found your website. I placed an order for 12 books on 2/25/10… I was wondering if you could give me an idea as to when I will receive them. We will be celebrating Passover a couple days early (3/27) and I was hoping I would have them in time. Thanks so much. 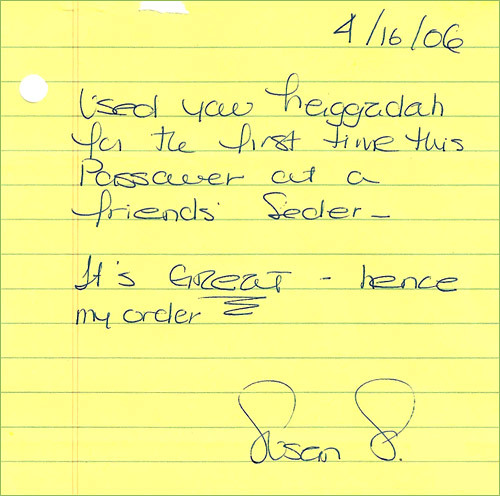 My son just ordered from you a few Haggadahs that we have used for over 40 years. My parents have always had Passover until it got too hard for my mother to do. We went out for a couple of years but took our trusted books with us. Yesterday at the age of 51, I led my first Passover with my parents and mother-in-law in attendance. This book your father wrote has brought joy to my family for years. Please keep this book going for generations. Happy Passover. I’m looking for the Haggadah by your Dad that looks like this… I was very surprised and happy to find your website, just by googling “Haggadah Martin Berkowitz”. We grew up with one copy in our home. My dad marked it up, and to this day, we follow his version of the Seder. Note from Jay: Janine, this is the Haggadah you have been looking for. This photo shows one of the original covers of my father’s book (click the image for a closer look at this vintage cover). When my father died 20 years ago, my mother gave each of us kids a set of the Haggadahs. I got your father’s because my husband doesn’t read Hebrew. Over the past 20 years, they have gotten very dog-eared as they have been well used. I have looked and looked and never found another Haggadah with as good a blend of Hebrew and English, traditional and contemporary. Your father’s Haggadah has given me a lot of joy and I’m delighted it is still in print. Thank you for sending me the first Haggadahs so promptly. Thanks for keeping up the tradition of the wonderful Haggadah’s. We used them tonight, and my friend had lovingly saved them from her childhood. They certainly made it such a meaningful Seder, and we wished that we could find some to replace the old fraying Haggadah’s. Imagine our delight at finding that you are continuing on the tradition of these wonderful Haggadah’s! Last night we enjoyed our Passover Seder, and one of our guests brought your Haggadahs for everyone to enjoy. (Haggadah for the American Family). The book was published by The Haggadah Institute of Merion Station, PA. 19066. It was a concise, easy to read booklet for both Jews and non-Jews alike. I believe the publisher was Martin Berkowitz. I am looking to purchase 15 of these providing that they are identical to the books we used last night. Please let me know if this is the right company that makes these understandable and pictorial handbooks. Please call me… to see if this is the same book we used last evening. It was about 25 pages. If they are the same, I’d like to order about fifteen from you. Thanks very much. Attached, please find an order form for 10 haggadot. My grandfather is leading the seder Monday night and although we have 20 people coming, he just realized now that he only has 12 haggadot. Please let me know if you will be able to deliver them by Monday — before the seder. My family has used your father’s Haggadah since the 1960’s, and I could not possibly imagine Passover without it. Sometime between this year and last, we misplaced our old Chase & Sanborn copies. I have turned my house upside down looking for them and have been despondent at the possibility of attempting to celebrate Passover without this Haggadah. To my amazement, I found you online, and now look forward to placing my order. I grew up with the Haggadah your father wrote, Haggadah for the American Family, English Service with Directions. Now that I am making the Seder, I would like copies of my own. I have looked at other Haggadahs and found them unsatisfactory. Could you send me copies? I could use 15. Thank you. It was nice talking to you. Please accept my condolences on the loss of Rabbi Berkowitz. He has made Passover a wonderful holiday for our family for the last 20+ years. I never had the pleasure of meeting him, but I’m sure I would have cherished the experience. I would like to confirm my order for 24 Haggadahs. This is a follow up for the fax order I just sent for 24 copies of the Haggadah For The American Family. Hopefully we will be able to receive them by Passover. My family has been using your father’s Haggadah since 1963. We have versions from all three printings, 1958, 1963 and 1966. We are very fond of this Haggadah. Most of us know the text by heart. I even used this version while teaching my Hebrew school students. I have been using my father’s Haggadah by Rabbi Martin Berkowitz copyright 1958. Thank God my family has grown and the Haggadahs are falling apart. I will gladly pay for 10 new Haggadahs even if I receive them after the Passover. Anyway started researching for the Haggadah for the American Family today. Wow, here they are! We would like to order 10. Thank you so much. As I’m packing up my Seder plate and Elijah’s Cup following our Seders this week, I keep glancing at the well worn pile of haggadahs. 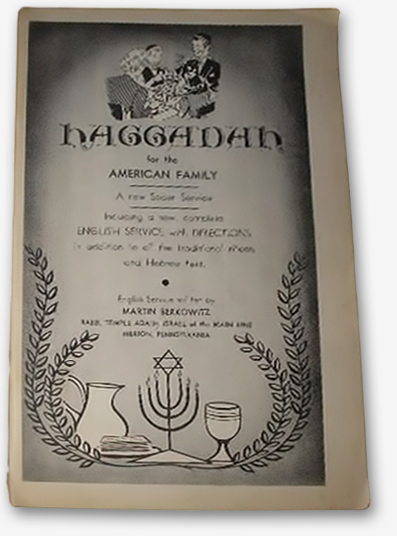 When my parents married in the 50s, they sent away for 10 copies of the Haggadah for the American Family written by your father. We have used those same 10 haggadahs through births, deaths, marriages, and illnesses. As my parents are now nearing their 80s, the tradition of hosting our family Seders has passed on to me. I have always assumed that our haggadahs are obsolete. You can imagine my joy upon finding your website this morning! I was filled with a sense of relief when I clicked on the sample page link, only to discover exact copies of the pages from our well-loved haggadahs. I felt like I had found a long-lost member of the family! I would like to order 25 copies of the Haggadah for the American Family to surprise my parents (and the rest of my growing family) at next year’s Passover. Again, our sincerest thanks. These haggadahs have been an integral part of our family for as long as I can remember. This year, Pesach was just not the same without them. I found your website… and wondering… are you still selling these hagaddahs. We have used ours for decades. 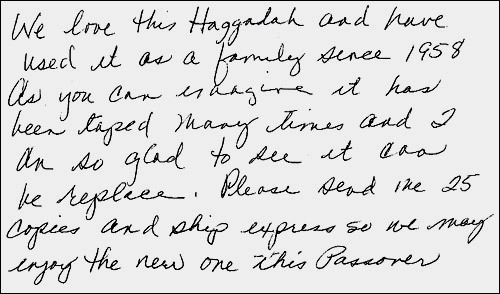 Our cousin, Lou K. also of Niagara Falls, NY, tells us that we can order copies of the above Haggadah from you on my sending you a check and the order. We are overjoyed to do this, as we have been using this version, with copious family “adjustments” over at least the past 40 years, it growing up with our children to our very own version. Replete with handed down songs, melodies and text changes as the generations of Bible and Hebrew lore-literate kids demand and participate in achieving them!This of course requires, where possible, additions of Miriam’s Well and other Debbie Friedman contributions, as well as family song-and-text modifications — but without the basic Haggadah for the American Family, we would not have been able to do this! Our order plus check is being mailed to you today, and these new books will lovingly replace the falling-apart, wine-stained copies — and thank you so much!! Remember me? I am interested in ordering another 100 Haggadas for our annual Second Seder here in Leisure World. Please let me know the cost, and I will send you a check. What a pleasure it was talking to you! It really made my day. Meeting you on the phone and getting Rabbi Berkowitz’s Haggadah will give this year’s Seder a special meaning. It’s hard to believe that a beat up Haggadah printed in 1958 has led me to a new friend. Out of curiosity, I Googled Rabbi Martin Berkowitz to see what information I could find on our favorite Haggadah. I was thrilled to have found your website! Am new at this, but I would like to purchase only five of your “Haggadah for the American Family”. Is there anywhere in Phoenix, Arizona where I can do this?. My family has used this particular Haggadah for over 50 years. I have almost enough for my Seder this year. If not, how do I go about ordering the minimum of ten. Thank You! I look forward to hearing from you. I need 50 copies of the Haggadah for the American Family before the 19th. Are you able to get them to me in Sarasota, FL by that time? Please call so I can order these for my yearly sedars, I am in desperate need for these, thanks. I got your e-mail address from a friend who recently purchased new [Chase & Sanborn] Haggadahs through you. My parents used this Hagaddah as I was growing up, and my friend used these at her seder the other day. It is an easy, concise booklet, and I would like to know how to purchase these. Thank you very much for any information you can give me. It was a pleasure speaking with you this afternoon. I need a quote for 150 Haggadah for the American Family Books – English Service with Directions written by Rabbi Martin Berkowitz, Merion, Pennsylvania, copyright 1963, 1966, 1975 and 1992 by Martin Berkowitz, Merion, PA USA, same as last year’s version. Thank you. Very pleased to have found the Haggad’im for sale new, as my Xeroxed copies have seen better days, what with the old Xeroxing plus wine and gravy stains. Would you be so kind as to confirm your receipt of my order for 30 made today at around 2:30 PM, as the fax machine does not always send a transmittal receipt. Thank you and a Ziezem Pesach. 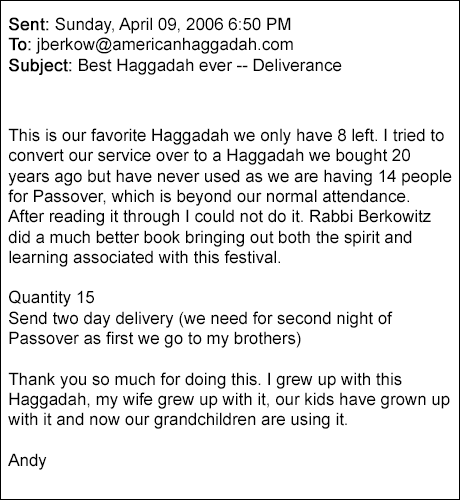 I’d like to order a few Haggadahs — “The Haggadah for the American Family.” I have ordered these Haggadahs from you in the past.Please email how much they now cost. Also, let me know the address where to send the check. Thank you. Need to replace your older copies? Avoid the Rush - Order now for next year's Seder. Genuine - Original - "The One You Grew Up With"